Each year, our Salford citizens are asked to make many pledges, to complete surveys and to make a change. #MySalfordPledge is different! As part of the Big Health & Care Conversation, hundreds of people pledged to help transform health and social care in the city. System leaders, front line staff and citizens all signed up to make a change and take responsibility for their own wellbeing – from making a lifestyle change, such as healthy eating, walking more or stopping smoking to using services more appropriately, cancelling health care appointments when not needed and getting involved on community action. These pledges will all go a long way in making a positive impact on our health and care services. But we can’t stop there! If you didn’t make a pledge, it’s not too late. Complete your pledge below and share your plans with us on social media, big or small we want to hear from you! Share your impact in action – when you’re out and about walking, the money saved from smoking less, heading to the gym or even the results you’ve seen from implementing your pledge. Together, we can make a positive impact on our health and care services in Salford. 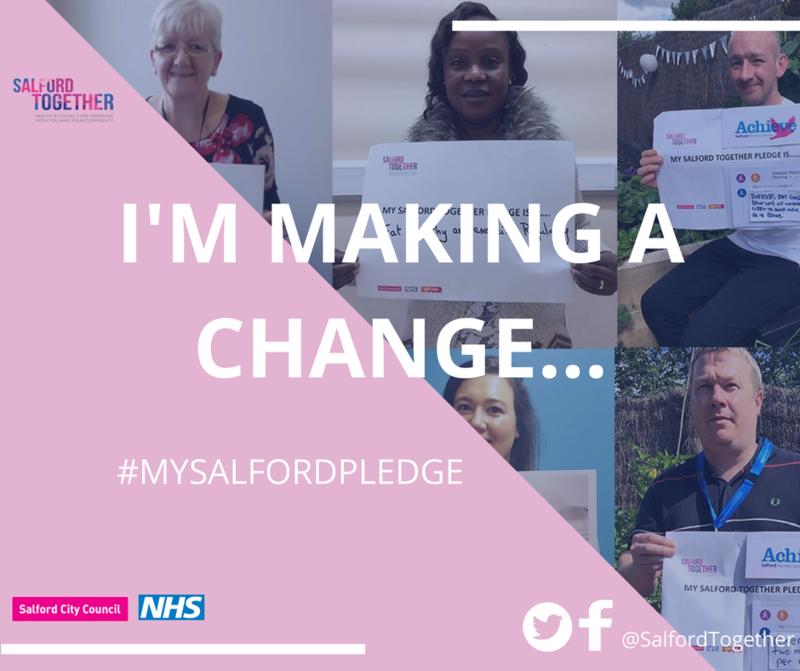 Share your pledge with us using #MySalfordPledge, or use the form below. Hundreds of people in Salford have pledged to help transform health and social care in the city. Leaders, front-line staff and citizens have all signed up to make changes pledging to take responsibility for their own wellbeing, to provide person centred care and to use services more wisely. These pledges show how making a small change can have a big impact. Thank you for contributing. Completion of this form will add you to Salford Together database.